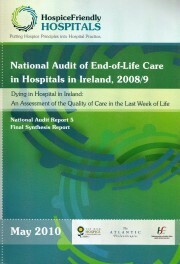 Synthesis report (Report 5), which draws together the key findings from the first-ever National Audit of End-of-Life Care in Hospital in Ireland, 2008/9. Study commissioned by the Irish Hospice Foundation, 246 pages. Reports 1-4 provide thematic discussions on more detailed aspects of the National Audit and are available from the Irish Hospice Foundation. The audit system of the Hospice friendly Hospitals Programme (HfF) is the first major initiative in an EU country to develop a comprehensive assessment of standards for end-of-life care in the hospital setting. The study involves the detailed capture of information on the end-of-life care experience of over 1,000 patients in 43 participating acute and community hospitals throughout Ireland. The first phase of the study commenced in November 2008 and finished at the end of 2009. The Evaluation was co-ordinated by Dr. Kieran McKeown. Trutz Haase and Jonathan Pratschke were responsible for all data analysis.